It was with much sadness that the staff of Auckland Art Gallery Toi o Tāmaki learnt of the passing of Ralph Hotere in Dunedin. We send our aroha to his wife, Mary, and to his family. Moe mai e te Rangatira. When we were planning the reopening of Auckland Art Gallery in September 2011, I proposed that Ralph Hotere’s Godwit/Kuaka mural be installed in the long gallery adjacent to the entrance foyer. This 18-metre long artwork was Ralph’s largest painting; Hamish Keith commissioned it from the artist for Auckland Airport’s Arrivals Hall in 1977. I told Ralph that we were going to reopen the building and show with Godwit/Kuaka, and I asked him to help decide how the work would be presented. He agreed that the space we proposed would be very like the corridor in which it was installed at the airport – its first home. Just before Christmas 2011, Ralph recorded the Muriwhenua chant Ruia ruia, opea opea, tahia tahia. When he called me and played his recording I was overwhelmed; it now plays in the gallery housing Godwit/Kuaka. I wrote a short essay about the mural at reopening, which we publish here for the first time. In 1977 Auckland International Airport commissioned Ralph Hotere to create a mural in response to the theme of long-distance air travel and arrival. In doing so it commissioned one of the largest public paintings ever produced in New Zealand – 18 metres in length. Originally titled The Flight of the Godwit, it was displayed on the rear wall of the airport’s Arrivals Hall to serve as the first welcome to returning citizens and as a greeting to visitors at New Zealand’s major entry point. The enormous artwork remained in this traveller’s welcoming area until 1996, when the airport undertook a redevelopment of the terminal building. The mural was deaccessioned from the airport’s art collection, and subsequently purchased by the Chartwell Trust and placed at Auckland Art Gallery. At that moment, the artist renamed his mural Godwit/Kuaka. Godwit/Kuaka weaves together many of the themes which Hotere’s work at the time was exploring: the relationship between the ancient Maōri worldview and the contemporary world; abstract art’s ability to evoke ecology and cosmology; the relationship between place and human experience. While Hotere’s mural honours and recalls the flights undertaken by the migratory eastern bar-tailed godwit (Limosa Lapponica Baueri) it sets up a metaphor in which the bird’s annual return represents our own travels and homecomings. This legendary shore bird is renowned for undertaking transoceanic journeys. Its stamina is legendary – not only is its journey a long one, but the godwit makes no stops for rest or sustenance along the way. Māori have long admired and celebrated the bar-tailed godwit; they named it the kūaka. 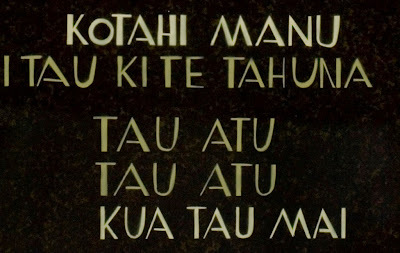 The kūaka’s arrival is celebrated in the ancient Te Aupōuri Māori chant which the artist’s father, Tangirau Hotere, taught him at Mitimiti in Northland. 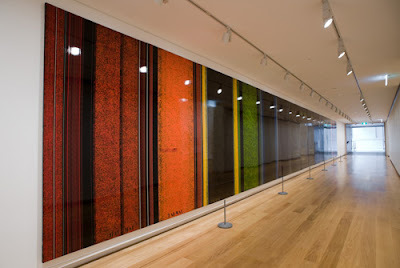 Walking the length of Godwit/Kuaka’s polished, reflective surface viewers meet the darkened central panels on which Hotere has recorded in capital letters lines from the Te Aupōuri chant. It is as if a bird’s flight has come to rest with a song. The dark centre is flanked by vertical bands of colour which pulsate slowly, advancing forwards and retreating backwards upon the shiny lacquer-like surface. This bandwidth of shimmering and piercing hues acts as a melody of arrival and departure. Godwit/Kuaka’s astonishing presence is not solely driven by its physical scale but by the emotion, the welcome, it creates. Looking like a fragment from a monumental loom in which the carefully drawn stripes are never-ending warps that bind the darkness of night to the colour of day, the mural sings to us and acts as a beacon calling us home, signalling our safe arrival. 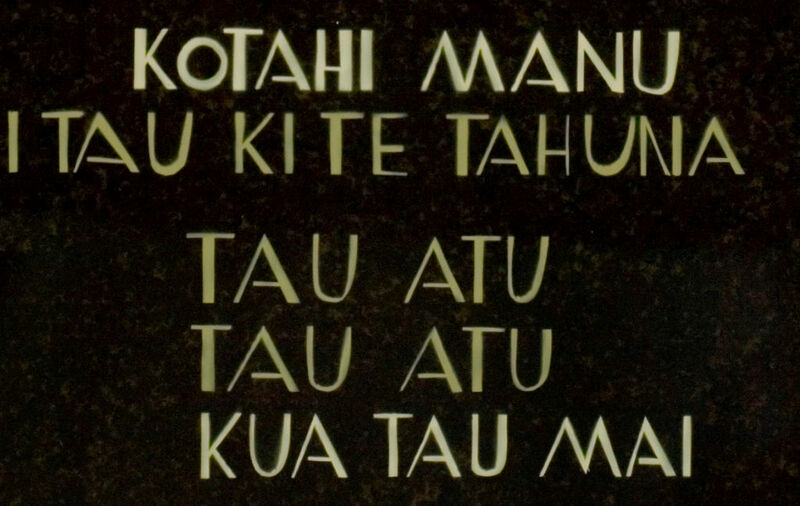 I appreciate the support of the Chartwell Trust, Ron Sang, and the family of the late Te Whanaupani Thompson (Nga Puhi, Ngati Wai) for permission to reprint his translation of the Muriwhenua chant Ruia ruia, opea opea, tahia tahia into English. The Auckland Art Gallery Toi o Tāmaki gratefully acknowledges the close assistance provided by Ralph Hotere, Mary McFarlane and Judith Ablett-Kerr, Chair, Ralph Hotere Foundation Trust in the preparation of this text about Godwit/Kuaka. The original location of this work seems to be the subject of some misinformation. It was in the incoming passenger processing area - which was not a corridor, nor a passenger welcoming area. It was the Pat Hanly work that was in a corridor. I was responsible for airport civil maintenance about 1980 and kept an eye on both. Hanly kindly came and did some minor repairs and charged us a paltry sum. The Hotere had a few small bumps at the base from vacuum cleaners but when I left in 81 it was in pretty good shape. A great art by Ralph. This great painting was very difficult to adjust somewhere but you did well. Gallery Explorers – no adults allowed!